Happy Monday, Everyone! Normally, I hate Mondays. I dread them. But this time of the year, I actually find that I kinda enjoy them! It’s starting to get really warm and nice outside and everyone’s so excited for summer. Plus, I’m a secretary at a college, so all of the students and professors here are pumped that this is the last week of classes, finals are next week, and then they’re done! Everyone’s just really happy, it’s great. 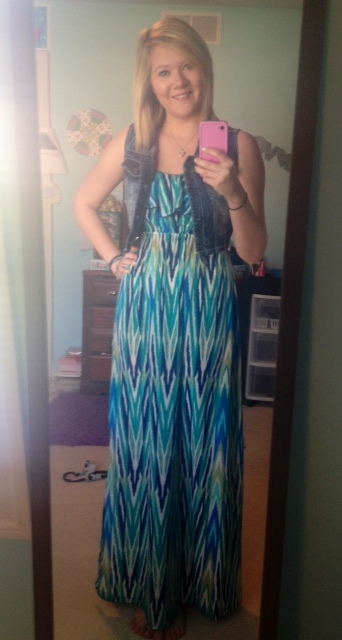 haha Since the weather is getting warmer, that means it’s time to bust out cute summer clothes! So, here’s an Outfit of the Day post for ya! Confession: Most girls wear dresses because they wanna look cute. Me, on the other hand? I wore a dress today because I didn’t feel like putting on pants. Ya’ll aren’t gonna believe this: I got this dress pretty much half half half off haha It was originally around $70 at Von Maur (which is a really nice department store) and I was like, “Whaaaat?! You must be tripping. I’m not paying that.” But I looked at the price tag and it was on major sale for $14! Crazy. So, naturally, I fangirled and bought it instantly! Plus, sky blue is one of my favorite colors and I think all these blues together is a really relaxing, really summer-y print! This is a suuuuper simple outfit, I only pretty much have two major things on, plus some blue beaded bracelets on my left wrist. Oh, and I just wore those really cheap flip flops you get at Old Navy for $2, so I didn’t feel the need to put them on for this picture… so, ignore my feet! I hope you guys enjoyed my first summer-y Outfit of the Day post! I don’t wear dresses often at all, so let’s all treasure this moment together (though, I did get a few maxis for my birthday, so I’ll show you those later this week!). Thanks so much for reading and I’ll talk to ya’ll tomorrow! Happy Cinco De Mayo! Get out and do something fun tonight, you deserve it!